I am providing this recipe in the spirit of Café Margaux. Lee and I love this soup, especially this time of the year when evening temperatures dip to 50 or so….BRRR. Sometimes, to increase the vitamin content, I add diced tomatoes (fresh when in season or canned when not) and finely diced carrots, to the broth. Once I make these changes, we rename the soup to Solivita Onion Soup. In a heavy bottom pot, heat the olive oil and butter over medium heat. Add onions, cook and stir until softened, about 10-15 minutes. Reduce heat to medium low and cook stirring occasionally until deep golden brown. This should take about 30 – 40 minutes. Add minced garlic and cook a few minutes longer. Stir in wine. Bring to a boil and cook until liquid is reduced by ½. Add broth, herbs de provence, pepper and salt to taste, and return to a boil. Reduce heat and simmer covered stirring occasionally for about 1 hours. Preheat oven to 400 degrees. Slice baguette and toast on a baking sheet. Turn baguette slices over and add shredded cheese to top and cook until melted and slightly browned. 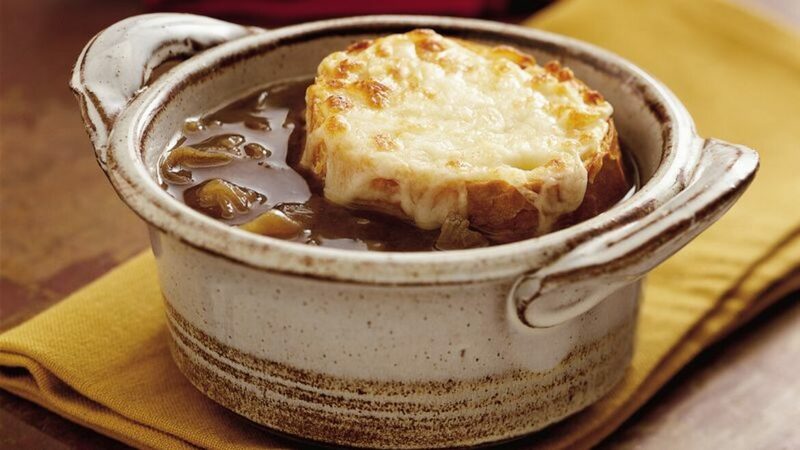 Serve soup in bowls and float toasted cheese baguettes on top.